You might have requirement to show report in CRM and we know we can use filteredView + pre-filtering report in CRM. We can construct our dataset with CRMAF_FilteredEntity as the alias name. And we can place the report into the Report Area, List, or Form. We know that the report can be saved in other format, such as PDF or Word and even you can print it. We also know that by using the pre-filtering report in CRM, you can have report with reliable contextual data based on the selected records through your selection in the User Interface and based on the location you place the records. We know when you enable this pre-filter report, we can run the report based on the record we opened to that form. *See the ‘Run on Current Record’ context. Yes, it has pre-filtered by default, by the current record you run. When you enable to display the record in the List Area for related record, then you can select records that you want to include in the report. You run a report in Report Area, then you can call the ‘Filter function’ which you can select multiple records or all records at once. So, it seems not too complicated if you know how to use this pre-filtering. But, have you realized if you want to print out multiple records using pre-filtering report, you want to print those records into multiple split pages, it can be difficult. Now the problem is coming when you want to show the selected records into different or multiple split pages, that is one record one page. For example, you want to create a Quote from an Opportunity. An Opportunity can have more than 1 Quote, let’s say 1 Opportunity 1 Quotes then you want to print all of the 3 quotes from the Opportunity and break them into 3 pages, one record one page. Not only 1 page then show those 3 records in one page. You want to run a report from Quote from the Report Area, which can have hundred records and you want to split them into hundred pages. So one quote, one page. Everything is fine when you run the report, you can see page header with body split into different page. You can see the Header and The body look perfect, just after the header and repeat for each record. And so on.. Until..the last. *You notice the first line after the header, It is always consistent shown after the header for each page. But, what happened if you save to PDF and print it.. It is totally changed, it becomes mix in one page and will continue put next record just after the previous record. The blue block is showing the part belongs to the current record which is defined before in the Page 2 of 36. The first line after the page header now is in the middle of the page and not just after the Page Header part. Now, you see the total page is 83, it is caused by the Report Page Size and you can see the report is becoming very unstructured. It will show non-stop, no break, and continuously showing the record without any break, which is not what I expected. Here, you can see the inconsistency when you run the report on the spot or when you save it to PDF. Don’t believe with what you can see before you save it to PDF or print it, because basically the customer will receive the paper with hardcopy and then sign it. Therefore, you need to tweak your SSRS setting manually to break them into multiple pages based on the record.. I am sure that you should have created the ‘Group’ before, if not then you might need to create a grouping, it can be using List or Tablix. Set the group based on your criteria, for example you want to print 1 Quote one page, then you might need QuoteId as the grouping expression, or you want to print 1 Account 3 Quotes, then you also need to group by QuoteId for each Account. This group is so important. *This example is to run report of multiple record of Quote and show the result, both in preview and in print mode as multiple split pages, each Quote will appear in one page, and so on. Thus, I try to group by QuoteId because QuoteId is I believe it as the Unique Identifier to identify each record in order to split each identity to each page. 4. Turn 'the magic' on..
*You can see, your data is 'being forced' to split across multiple pages, both in Preview or in Printing Mode. *This is what I expected..It does not enlarge the data inside and fit it into one page, instead, it is printed in multiple different pages. So, if you want to display the the Report in Form, list, and Report Area and you want to split them into different page for each record as advance report then can be printed to customers, you need to set your own Page Break, because after you upload the report to CRM, CRM will not split into different pages, it will show you in the report preview, but when you want to print it, you will not get what you wanted, you need to set your own ‘Page Break’. *And another tip, I tried to create report with nested group and then I give page break to both of them, it was running well in the ‘Preview’ mode in the BIDS, but when I upload to CRM and run it, I got error, such as ‘Invalid Argument’. Then, I was ruined by this issue, and then actually that was caused by I turn ‘Yes’ the Page Break for each group, including child group resulted error on page when I run the report. Thus, I just use only one group, I choose the smallest group as my grouping, and the only one, no more nested, and ignore the big brother, then set the Page Break to this group and it worked. 2. Apply a Page Break for that Group. *This post might be useful if you want to print out multiple record or hundred and more records in CRM but you want to display it into split or separate pages and repeated for each page, each record each page. In the next post I will explain how to handle multiple split pages in SSRS with dynamic Page Header in line with current data/record based on the each record with same dataset using pre-filtering CRM Report. CRM 2011/2013 Understanding The Privilege to Show and Hide 'Write-In Product"
We often have requirement to hide the ‘Write-In Product’ choice for Salesperson to insist them to use Existing Product from Product Master records. Then there is now way to choose the Write In. But, what if the users want to hide through this inline grid? Actually, there is a privilege managed in Security Role to control this visibility. Go to the Security Role and go to Sales Tab. In the Misc. Privileges, you can see the Override ‘entity’ Pricing. So, for example you want to hide the ‘Write-in Product’ under Opportunity, then don’t give permission to ‘Override Opportunity Pricing’. But, unfortunately, this is also make the person assigned to that security role also cannot override the Price, it means always ‘Use Default’ pricing. *If you want to show the 'Write-in Product' then you just give full access to 'Override Opportunity Pricing'. *For another entity, you can give or not give permission to Override Invoice Pricing and so on based on your expected entity. I hope in the next release, the Microsoft product team will split them into two different privileges. It will work for clients who don’t want to the Salesperson using price different from the Price List assigned to them, some customers will agree to block those two functions. I hope this helps you if your customer doesn’t allow the Salesperson to overwrite the price. Often, we have requirement to have chart showing comparison of sales performance (can be Closed Opportunity, Won Quotation, Paid Invoice, Monthly Sales Result or other parameters of performance) between Last Year and This Year. So, this is a simple post explaining how to create Comparison chart comparing Last Year This Year Performance without any coding. 1. So now I have a custom entity, Monthly Sales Result. So now we have a filtered view only showing data in This Year and Last Year. Save it, Publish and see the result. Are you in charge to create reports involving Activity entity? Or you also have requirement to show Activities with participated Customer or Potential Customer? As far as Activity entity in CRM is concerned, we know that this will not be easy to do query to retrieve Activities List plus the participated Customer since they are not stored in the same entity and in the Activity entity, it has no direct relationship to Account or Contact, and when you take a look deeper, you will be understanding that this is a complex relationship. We know that activity entity is stored in the FilteredActivityPointer, but from that view, we know that no contact nor account is having relationship with that view. The fact is, the relationship between Activity and Contact/Account/Lead/User are actually involving another party, that is ActivityParty entity. So, I know that we need to link the Activity with the ActivityParty to get the participated related Customer record, or CRM prefers to call it “Party”. In My Previous Post, I was talking about relationship between Activity entity and the Activity Party as well, so you might refer to that post. Now in this post, I will talk about SQL Query to retrieve data from Activity and plus the participated parties. Let’s start with simple query first..Better you follow the steps from beginning until the end to understand by sequence. *I am recommending to use FilteredView to your reports. You can also retrieve activity from individual activity type table, for example: PhoneCall, Task, Appointment, ServiceAppointment, Email. 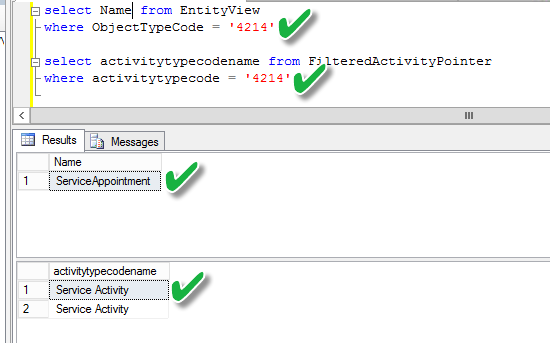 So now we know that CRM has separated tables as well to store each individual activity type, the problem is how to show all activities from all activity type (combined together) with showing fields that exists only for specific table, let’s follow this section. we have two custom fields: Message and Purpose. Those two fields are only exist in the SMS entity. We know that each activity record will be stored in the ActivityPointer entity, so to show all activities from all types we should query against this entity and get all of the standard fields, but this is not for custom fields. So, what if I want to show the message and purpose field of SMS together will all activities? Until know, we understand how to combine all of the activities across all activity type and showing the specific field from each Activity type, we understand that in SMS entity, the message was stored in the Message field (I am purposely not using description field), but how about email? Email, by default has description field to store the body content, and it happened to Appointment, Phone Call, Task, etc. Now, how to combine them together into one field, let’s call the it: “Content”. So, we’ve known how to retrieve al activities, so how to link to the Contact? We have known about the ActivityPointer and ActivityPointer. We know that the ‘participationtypemaskname’ is the field to store the ‘To Recipient’, ‘Sender’, etc. Because of its design, by joining two entity view, ActivityPointer and ActivityParty, now we can produce a report to show activities and their related parties, but we also know that Parties can be Customer, Prospect, or Resource, so how to differentiate it? *Owner and Regarding are not always limited to ActivityParty relationship since Owner can be User or Team (Team is not defined in the ActivityParty) and Regarding are related to any entity that can have Activity, so you might found the PartyName is NULL. So, we’ve known that ActivityParty is basically an intersection table to store the relationship between ActivityPointer and Account/Contact/Lead/SystemUser. (Lead and System Users are usually people don’t care about it, but we should know that the ActivityParty can link to those entities as well). Now, next issue, what if I want to produce report to show all activities, all related parties, and customer details, such as customer name, customer surname, and customer address. They key is we have to join table to all of the ActivityParty Type. Well, we have learned how to show activities + customer + customer detail, now we can also go to next section with new challenge, filter by specific customer criteria. As we know that Activity is not only involving external Party or Customer, some activities such as Phone Call, Email, Service Activity can also involve our resources, so what if we want to show All Activities by Company Resources or Employee? Next section, I will explain about how to retrieve specific activity list with the linked customers. So, guys, I believe that we have done about activities and activity party, so I am giving complex queries to summary. There are two complex queries that you can use to show activities and of course link them to the Contact or Account or Lead or System User. This is the completed query by joining activitypointer, activityparty, each individual activitytype, and each individual activityparty. SMS is a custom entity, you might not need it. How to merge the rows into columns to construct 1 record only, instead of displaying in two records or rows (1 row for ‘From’ and 1 row for ‘To’)? You can also filter the participation type. To simplify the result, I will pick one activity and only to show From and To fields. You can also utilize the query based on your requirement. *Service Activity is equal to Service Appointment. *You can add FilteredNew_SMS for new custom activity entity, FilteredFax for system activity, etc..
*You can also remove the Lead or System User if you don’t want to include them. Now, we’re reaching the End and you have learned the secret relationship to link Activity and Customer in detail. You can also do your own complex query and just contact me if you have any question about basic or advance query related to this post or anything. I hope my post can help you to finish your report development and to answer all of questions about how to link Activity List with Account or Contact (or Lead or System User) relationship. CRM 2013: Are You Missing ‘Imports’?